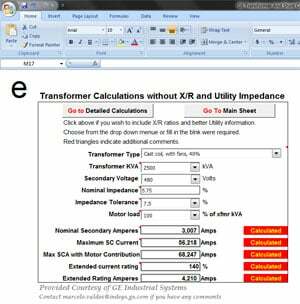 Simple Calculations will furnish base current and extend current capability for identified transformers as well as maximum short circuit current based on infinite MVA at transformer pirmary. Detailed Calculations will provide base load current and short circuit currents for identified transformers considering primary MVA and impedance details for transformer and Utility. Transformer Tables will provide based and extend rating currents for various sizes and types of transformers. I am not able to download the above Spreadsheet.. Please advise how can I get it. but it is more than a month that i can’t download anything , is it something wrong about your site or it is my computer problem ? I have a query about On load tap changer employed for power transformer. I worked with MR make OLTC’s diverter switch and loading resistors for tape winding. As my understanding the diverter switch changes the polarity of windings that needs to be added to get voltage addition and subtraction. But, I believe that there are Unidirectional & Bidirectional OLTCs based on charging of transformer practiced either in both way(HV/LV for step up and step down) or only one way ( Either Step up or step down) as a understand.But,my doubt is a transformer can be used either for step up or down, But why the OLTCs are classified as unidirectional and bidirectional. Please give me detail clarification on it.